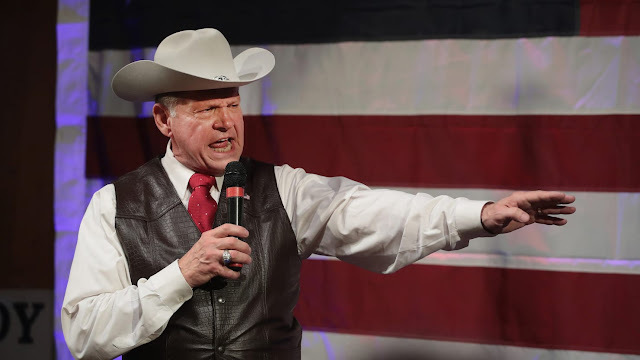 The Gay Almanac: Washington Post Calls Homophobic Roy Moore "Unfit to Serve"
Washington Post Calls Homophobic Roy Moore "Unfit to Serve"
Though the Post argues Moore's rise has been fueled by anti-Washington anger, a large part of his appeal in Alabama may also be his view of the LGBTQ population. Republican Alabama Senate nominee Roy Moore once argued that the Supreme Court’s decision to legalize gay marriage was “even worse” than its ruling in the 19th century Dred Scott case, which found that African-Americans were not citizens, and therefore property. “Yes, sir. I was simply pointing out that in 1857 the United States Supreme Court did rule that black people were property. And of course that contradicted the Constitution and it took a civil war to overturn it,” the former Alabama Supreme Court chief justice told the “Here I Stand” podcast last November. Moore has previously come under fire for other provocative comments, including 2005 footage unearthed by CNN in which he argues that homosexuality should be against the law.